The atmospheric river is overflowing. What is the Pineapple Express? The map below depicts atmospheric moisture. That bright blue surge of deep moisture stretching from Hawaii to the West Coast represents the Pineapple Express. Another name for this would be an atmospheric river, which is a term used to describe narrow surges of enhanced water vapor around the world. 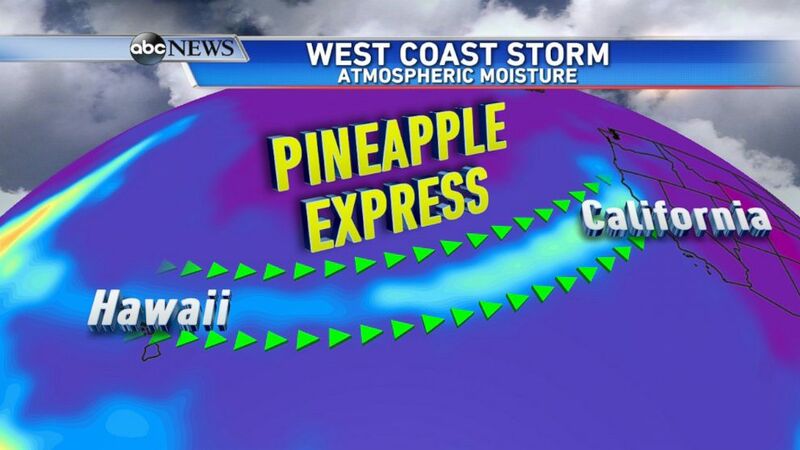 But this specific corridor of moisture from Hawaii to the Pacific Coast carries the name Pineapple Express. The storm is affecting Seattle to Northern California today; Central California/San Francisco tonight/Thursday; and Southern California Thursday night/Friday. The Pacific Northwest could see 2 to 4 inches through Thursday, they are getting heavy rain right now. Northern/Central California is where the most rain is likely to fall: 2 to 12 inches possible here that could result in flash flooding and mudslides. San Francisco could get 2 to 5 inches but even more rain in the hills of the Bay Area is likely; if we reach 4 inches in San Francisco Thursday and Friday that would be the strongest since 1998. 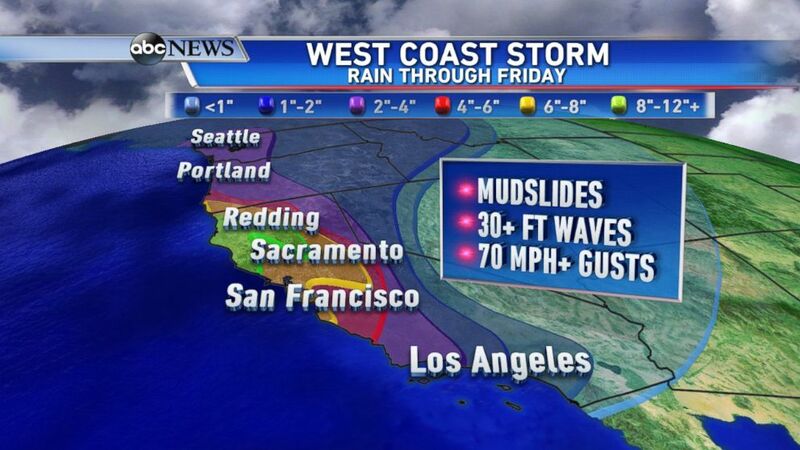 In fact, this is potentially the strongest storm for the West Coast in several years. Rough seas also expected, waves could reach 25 to 30 feet. (ABC News) Rain forecast through Friday for the West Coast. 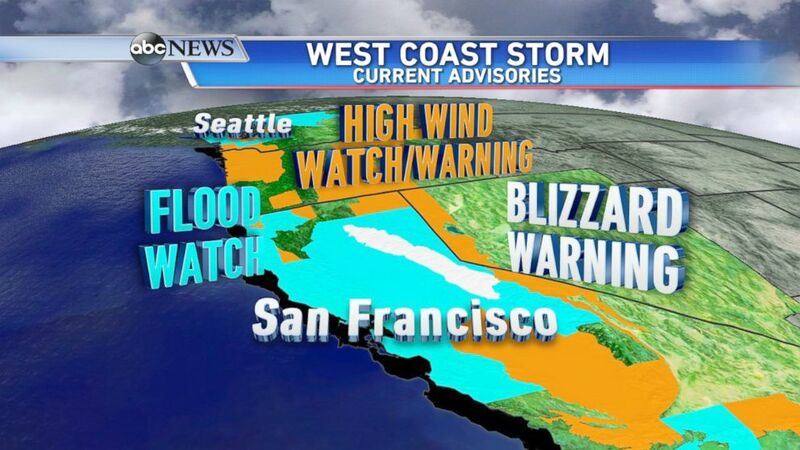 Practically the entire West Coast is under some sort of watch or warning. A big factor in this storm is the high winds, so high wind watches and warnings stretch from Seattle to Southern California. Gusts could exceed 70 mph, and even over 100 mph in the mountains. Downed trees and widespread power outages are likely. There are also numerous flood watches posted for the heavy rain, flash flooding in urban area, and mudslides/debris flow – especially in burn-scar areas. In the mountains winter storm and blizzard warnings are posted: 1 to 3 feet of snow possible along with whiteout conditions.